Maple is a hardwood with a straight grain, light color and uniform appearance. Versatile and durable, it has a sleek, clean look when stained. 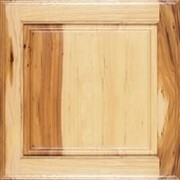 When it’s finished to resemble expensive woods like cherry, making it a favorite for many kitchens. 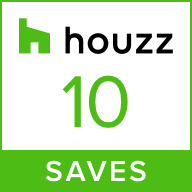 It’s perfect for painted cabinets, because the finish goes on smoothly. Maple is great for a light, airy appeal or a darker, dramatic look. 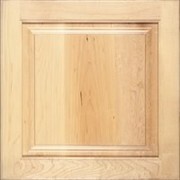 Oak’s distinctive grain and colors are an old favorite! This hardwood is durable and timeless, lending itself to many different cabinet styles and finishes. 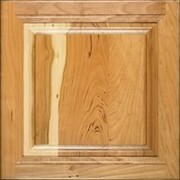 White oak and red oak are both great wood options and take all stain colors well. 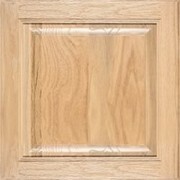 Take a look and discover the warmth and depth of color you find in oak doors. It offers classic appeal and good value, too. Birch is a straight-grained hardwood that’s very durable and takes stain well. Predominately light in color, it has dark reddish-brown heartwood which results in a unique color variation. It’s versatile and looks good in any stain color for stunning results in a casual space or more refined setting and has a price that offers a good value, too. 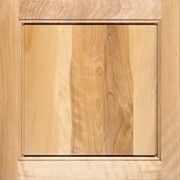 Hickory has the widest variation in color and grain as any cabinet wood we offer. In a natural finish, a hickory cabinet is perfect for a rustic setting. It has an array of prominent colors ranging from very light cream to dark reddish brown to almost black. A medium or dark stain will mute the dramatic color differences somewhat, still letting the distinctive grain show through. Cherry has a smooth grain and a color variety that ranges from creamy pink to reddish gray. It darkens naturally when exposed to bright lights and especially UV rays. This process is known as mellowing and is one of the properties that make cherry such a unique hardwood. Because of its higher price, it’s considered a luxury wood and it will bring a warm, rich look to any room.